Yes it's me again. Today I came up with a new recipe for whole fish. As you will remember I purchased an air fryer last month, and let me tell you. I am amorous with this machine. 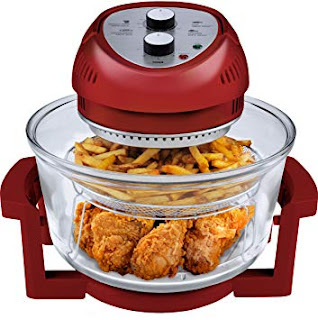 There are many brands on the market, but I chose the Big Boss Oil-less Air Fryer, 16 Quart, 1300 watt simply because I like to watch my food as it cooks. And so far, I have not been disappointed. This Big Boss Air Fryer has really changed the way I prepare our meals, especially meats. As we like the taste of the foods I cook, I opted to convert as many of the recipes for meat, fish, and chicken as possible. This being said the recipe below is one I converted from my deep fryer to my air fryer. Place mesh basket and lower rack inside of the air fryer bowl, then stray each with cooking spray. While air fryer is heating, rinse fish and pat dry. Then in the plastic bag add your favorite batter. Place the battered fish in the mesh basket, and then place the lower rack on top. Use the four strings to tie four bows to join basket and the lower rack together. This keeps the fish in place and prevents them from breaking when turning during the cooking cycle. Now, place the bound fish in the preheated air fryer bowl and spray the top of the fish with cooking oil. Place the lid on the air fryer and set time to 9 minutes. After the 9 minutes is up use the tongs and the oven mitt to prevent burning yourself, then turn over the basket with the lower rack in place. Spray this side of the fish with cooking oil as well. Replace the air fryer lid and cook for 9 minutes. When the timer stops set the cooking time for an additional 5 minutes, then repeat on the other side. When the fish is done untie or cut off the strings from the basket and the rack to get the your prize of golden brown and crispy yet moist inside ocean whiting. If you love fried fish and have a Big Boss air fryer give this recipe a try. It can be adjusted to many types of whole or thick fish fillet. Who Said You Can't Make Air Fried Corn Muffins? !